What an overdue post. I’m sure I could list 100 reasons but I’ll try and keep it at ten. Cruising has changed so much over the last few decades. It is almost unrecognisable from the days of ballroom dancing, formal dining and afternoon tea. There are of course cruise lines which still provide this traditional cruising experience. They have a very loyal following but I would not say I am one of them. I am far more interested in the experience that newer cruise lines have to offer. For me, the number of waterslides on the top of a ship says a lot about how much I am going to enjoy the cruise ship. The more the better in my opinion! One of the main things which, I believe, has been holding back younger people from trying cruising is the traditional dining routine. I’m sure there are quite a few people terrified that if they cruise they’ll have to wear a bow tie and sit with a lot of old people on a giant table. Fortunately this is not the case. Many of the larger cruise lines have dropped this ‘set meal set table’ idea in favour of being able to eat where and when you want. On cruise lines like NCL and Royal Caribbean you are able to show up to the restaurants and be seated the same way as you would in a land based restaurant. There is also normally a buffet which means (almost) 24 hour access to food. Not just food, but really really good food with tons of variety. 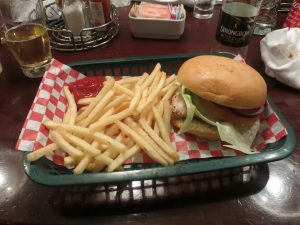 As well at the more traditional ‘fancy’ foods of the main restaurants there is also often a pub/diner type restaurant where you can pop in for a burger. The formal dress required on more traditional cruise lines has also been removed on a lot of ships. There are still opportunities to get dressed up and have professional photos taken however on cruise lines such as NCL and Royal Caribbean there is no forced formal dress code (not compared to cruise lines like Cunard anyway!) This means you can pack much lighter and don’t have to worry about ironing your party dress. All in all it makes for a much more relaxed atmosphere. The popularity of all-inclusive beverage packages is without a doubt increasing. Cruise lines such as NCL are now offering it as part of their special offer booking package. There are very few holidays where you can have a free bar for the length of your time there, let alone 10+ free bars 24 hours a day! Cocktails by the pool, glass of Prosecco with lunch and whatever beer/wine/spirits you fancy long into the evening. For more info about NCL’s ultimate beverage package, including my drinks recommendations. Click here: NCL’s Ultimate Beverage Package. 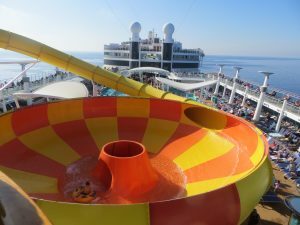 There are so many on board activities now which would have been unthinkable years ago ago, rock climbing walls, zip lines, water slides. With the size of cruise ships increasing this means that there is more room for new activities! Theres are theatres with musicals, comedians, jugglers, magicians, a casino, bowling alley, arcade, sports courts, spa, gym. The list goes on and on. Not to mention all of the eating and drinking which is one of the best activities to do…Cruise lines are constantly trying to out to do each other with the latest activity, all in an effort to attract young thrill seeking cruisers. Being on a cruise, to me, is like being baby sat. It’s a really easy way for young people to explore multiple countries within a relatively short period of time. Cruising allows you to visit exotic destinations which you may not have gone to alone. It allows you to see a country for a day. If you like it you can return but theres certainly no obligation to do so. I’ve have visited a few which I definitely will not be returning to! (See 5 cruise ports I would not return to). It is thanks to cruising that I have been able to visit 35 countries at the age of 23. I certainly couldn’t have achieved such a number without cruising. Robot operated bars, 3D movies, virtual portholes, facial recognition in photos and so much more! With each new cruise ship comes new innovations in regards to technology and onboard gadgets. The latest ‘trend’ at the moment seems to be for wearable tech. Carnival have launched the ‘ocean medallion’ which can be worn as a necklace/bracelet. This will be used to pay for purchases onboard, it’ll unlock your cabin door and help you with onboard navigation. If cruising was just for old people I really doubt that they would have shows such as ‘Priscilla Queen of the Desert’ onboard. Priscilla is without a doubt my favourite musical, I first saw it onboard the Norwegian Epic and went back the next night to watch it again. It is an amazing show but I don’t think I’d fancy showing it to my Gran, not sure what she would think of all of those teeny drag outfits! Productions onboard cruise ships are as good, sometimes even better, than those on land. The theatres are large enough to stage full musicals, dancers, circuses and anything you can possibly imagine. I have been to much smaller theatres on land than those on cruise ships, I always forget that I’m on a ship when at the theatre. 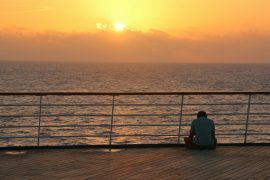 Price is one thing which has in the past, meant that cruising was reserved for the wealthy (and as a result usually old). Cruising is still a relatively expensive way to travel but when you compare it to staying in a hotel on land it doesn’t seem as expensive. Factoring in the cost of meals and entertainment cruising can actually be the cheaper than staying on land! 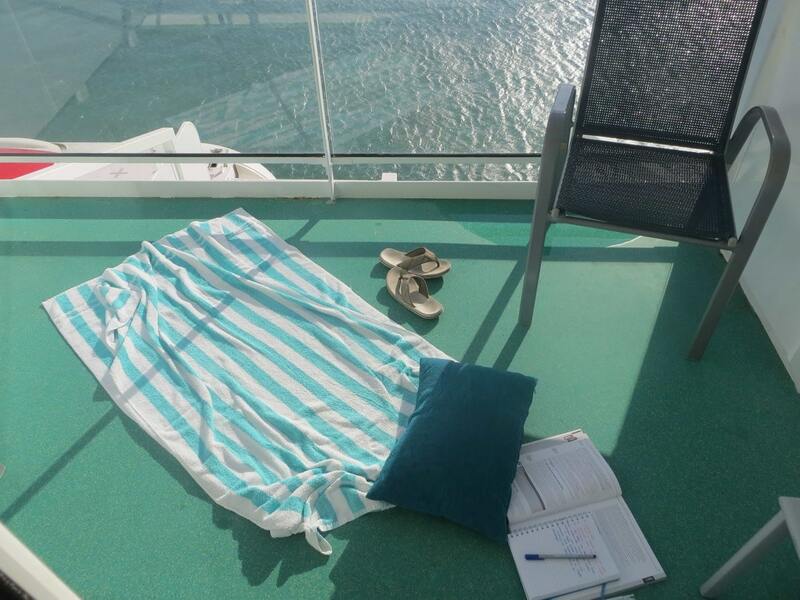 On my recent holiday to Miami it actually worked out cheaper to take a week cruise than stay in hotels for a week. There are ways to minimise the costs of cruising. For more information on how I cruise on a budget click here: 10 tips for cruising on a budget. Cruising is the ultimate way to get away from it all. You can be as connected or as disconnected as you want. This definitely appeals to me and I think it does to a lot of other younger people too. I love being uncontactable! It provides the ultimate opportunity to relax. There are no time schedules and nothing at all that you have to do. 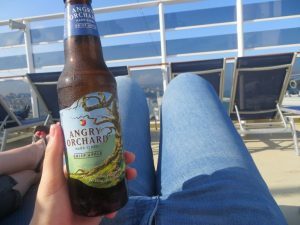 I can’t think of any other time in life where I am as free as relaxed as onboard a cruise ship. 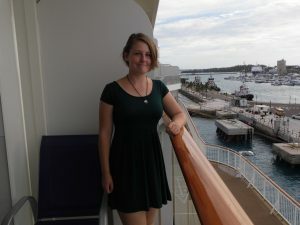 I am living proof that cruising isn’t just for old people. 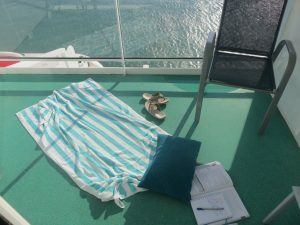 Through writing this blog I have made tons of friends who are a similar age and living life one cruise at a time. Are you a young cruiser? Why not join the young cruising conversation. We’re an interesting bunch! As for NCL and RC not having a formal dress code, they don’t have the Cunard kind but RC does have formal nights. Two usually on a 7 day sailing and some folk do push out the boat so to speak 😉 Mind, I have seen guys in three quarter length cargo pants and t-shirts in the MDR on a formal night so it is not enforced. Very relaxed and some ppl do dress but hardly any tuxes. Ladies always put more effort in than guys.. So true! I do think I compare ‘formal’ dining to Cunard, I doubt anybody else will be as formal as that. I thought the same until I found the right cruise! But I had no idea Royal Caribbean also had the free style dining and no dress code: it’s the best thing ever! You don’t have a set time and you aren’t on the clock, which is something I hate when I’m on vacation! As for entertainment I’m also voting for Priscilla, it was such a GREAT show! So glad you agree! I’m trying my first Royal Caribbean cruise in October and really excited. I hope I’ll like it (sure I will). The freestyle dining is my favourite thing about NCL so hopefully I’ll like Royal just as much. I’m cruising on the independence of the seas and it looks incredible! haha I actually know a few friends who cruise with their family, though less group of young people do it rather than couples! I would love to go on a cruise but haven’t’ find the “perfect” one yet! Keep your eyes peeled! I’m sure there is one out there for everybody. I’m sitting in my stateroom on the Regal Princess, day 5 of one of the worst vacations in my life. I can confidently say that 1 of 10 of your points hold true on this cruise. – it is true that you have a nice blog. I actually got reprimanded by the dining room for trying to cancel my required 8:15 seating. The drink package is $60 a day. If you spend that much on alcohol, you are probably an alcoholic. There is an AA meeting on the ship, though. There is nothing to do besides shop, eat or gamble. The entertainment is basically a good high school choir showcase. I’d say 80% of the guests are at least 70 years old. All this for just $750 a day. I think I could do a LOT better planning my own vacation. No more cruises for me! So, my advice is to carefully check your intended cruise to see if any of what the blogger says is actually true. I’m sure there are better cruises out there than the one I am currently trapped on. I have a couple of questions. Firstly, what kind of cruise is $750 a day?! 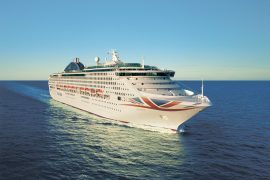 I usually spend around £100 a day when I cruise which is around $130. Sounds like you wanted a more active cruise, I love Princess and have cruised with them twice but they are not the most lively of the cruise lines. I’m sure Carnival or Royal Caribbean would suit you better. Did you do much research before booking this? $750 a day including airfare for 2 people. The cruise itself more like $300 per night per person. Didn’t mean to rain on your cruise parade – just wanted people to be educated about the variables between cruise ships. My ideal vacation is a week or two in a beach town like Honolulu or a week or two in a major European city.